Tayo Heuser, photo by Scott Lapham. Tayo Heuser’s father was in the diplomatic corps; she was born in Washington, D.C. and grew up attending French schools in Europe and Africa. She came to the Rhode Island School of Design, pursued post-graduate study there and obtained her MFA from Vermont College. Originally a painter, but becoming known for sculpture, Heuser today has immersed herself in a meditative world of exquisite, minimalist ink drawings on paper that has been stained, coated with organic materials, and then burnished. Heuser finds her abstract compositions akin to poetry rather than prose. 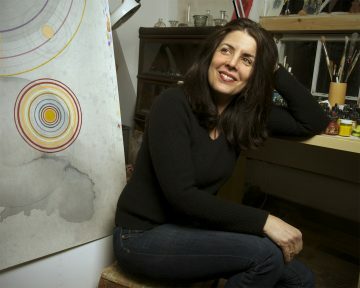 She has exhibited her work nationally and internationally, with a recent exhibition at the Phillips Collection in Washington, D.C. She teaches at Roger Williams University. Inks on hand burnished paper, 82 x 37.5 in. Produced by: Joseph A. Chazan, M.D.